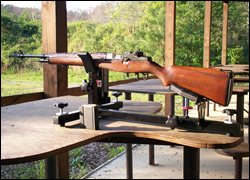 The market for rifle rests has seen an increase in manufacturer offerings in recent years. A quick perusal of shooting enthusiast catalogs such as those from Midway, Cabela’s, Gander Mountain, etc… shows many models from established manufacturers, as well as entirely new offerings from manufacturers entering this segment of the market. Additionally, a stroll up and down the aisles of shooting sports retailers such as Cabela’s, Gander Mountain or Sportsman’s Warehouse offers many fine examples of the different types of rifle rests available to the shooter. Traditional sand-filled forearm and buttstock leather bags. Individual precision rests for both forearm and buttstock support, of the type commonly used by benchrest and other precision shooters. These incorporate very fine adjustment mechanisms, and are often used in conjunction with the appropriate leather bags which cradle the rifle stock. One piece cradle-type rests with independently adjustable mechanisms for adjusting the height of both the forearm and buttstock. Some of the high end cradle-type rests have very fine adjustment mechanisms fore and aft. Some also offer the shooter a reduction in felt recoil by providing for the addition of weight, in the form of bags of shot, to the frame which “soak up” part of the recoil. How much recoil is reduced depends on the caliber being fired, the design of the rest, and the amount of weight/shot added to the rest. Shooters now have several choices when selecting an appropriate rifle rest for precision shooting, scope sighting-in and, depending on design and features, a handy vise for use in cleaning or working on one’s rifle. For the purposes of this review we are going focus on one of the newer cradle-type rifle rests which when combined with an optional vise assembly allows it to double as a rifle vise for scope mounting, cleaning or general maintenance. 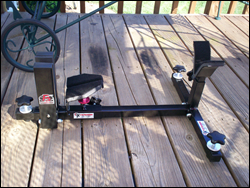 The particular rifle rest and vise are two of the latest product offerings from CTK Precision of Marion Wisconsin. CTK Precision is recognized as a leader in the shooting accessories industry with their innovative product designs for rifle rests and vises, rifle buttstock monopods and collapsible foregrip monopods for use with Picatinny rails on AR-type rifles. All of CTK Precision’s products are proudly made in the U.S.A. 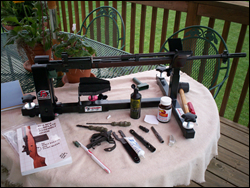 The rest is their “P3 Ultimate Shooting Rest” model, and it came with the optional “P3 Ultimate Gun Vise” assembly which allowed it to pull double duty as both a shooting rest at the range and a handy vise back at the workbench. The first thing I noticed when I opened the box containing the disassembled rest, was that the frame component pieces appeared to be well made of thick gauge squared tubular metal and finished nicely. The pieces had no sharp edges, with most being slightly radiused. Weld seams were ground smooth and all were painted in a nice, even gloss black color. Overall the construction and finish of the frame pieces gave the impression of the manufacturer’s use of quality materials and construction methods. Similarly, the three bags of associated washers, nuts, bolts, rubber legs, and end caps contained all required pieces with which to assemble both the basic rifle rest, and the optional vise mechanism. Instructions for putting together each assembly were easy to understand and descriptive; with schematic drawings showing the numbered stages of construction with each component piece clearly identified on the schematic. Total time to construct the rest and vise assembly was approximately 25-30 minutes. The directions also offered insightful tips such as greasing each of the adjustment mechanism screws prior to assembly so that subsequent adjustments would be smooth. These mechanisms are the set screws that raise/lower the padded front forearm “U” post as well as the long threaded nut and threaded disk that are used to precisely raise/lower the grooved, padded buttstock rest. Alternately, this rest can also be used with handguns and the adjustment mechanism for the buttstock rest can be lowered below horizontal, if needed, to accommodate the grip frame of a revolver or pistol. Each of the three legs on the outboard points of the frame also incorporates smooth screw-type adjustment mechanisms to assist with leveling the unit on a firing surface such as a shooting bench. The leg tips have rubber feet to aid in obtaining a sure-footed grip on a bench top. The manipulation of these two forearm and buttstock controls allows the operator to smoothly obtain indexed and repeatable settings. An adhesive backed 4” length of tape measure was included in the parts. Per the instructions it was affixed to the forearm “U” post in order to allow the operator to record settings used for different rifles or shooting scenarios. The index marks on the tape measure are not meant to reflect the actual inches up from the bench top surface that the notch of the “U” is set at. Rather, they are relative index points for quickly re-indexing the front support to a particular height, for an individual rifle. Additionally, the directions stated that lead shot could be poured into the frame’s metal tubes prior to installing the end-caps. This would allow a “contained” method to add weight to the rest for use in reducing felt recoil. Additionally bags of shot could be laid across the frame if necessary. In initial testing, I did not add shot to the frame at the time of assembly. The gas-operated, relatively heavy M1A rifle that I shot across the rest in testing does not produce bone-jarring recoil so I deemed this recoil reduction enhancement as unnecessary. The vise assembly is a novel design which incorporates two separate pieces acting as opposing padded “jaws”. These are held together at their lower frame rail attachment points by both a woven elastic band and by an adjustment screw running cross-wise across the width of the two jaws. Of note, there is a cleaning rod hook on the side of the left hand vise jaw, which corresponds with a concave dished spacer washer that is attached to the front rest assembly’s adjustment screw knob. You can lay a cleaning rod on the hook and the spacer washer and it will be level and parallel with the frame of the rest. The function of the elastic band is to allow the vise jaws, when loosened sufficiently via the adjustment screw, to be “snapped” on and off over the central frame rail. 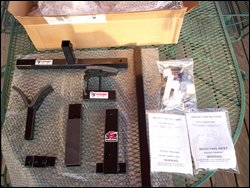 The rear frame leg of the rest does not need to removed in order to allow the vise assembly to be slid onto the frame rail. The only potential downside to this design is if the woven elastic band gives out, the two vise jaws will not be held in proper alignment for affixing to the rifle rest’s frame. Maybe a spare would be warranted to be included in with the parts kit. Enough of the small talk, let’s head to the range! 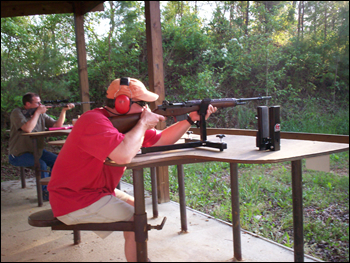 I, along with a friend, tested the basic-configuration rest at our local 100 yard range with covered firing benches. Rifles used were an open-sight M1A and a Smith & Wesson M&P 15, outfitted with an Eotech sight. 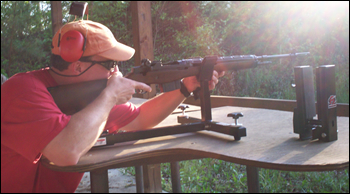 Once the shooting gear was unloaded and the targets were stapled downrange the initial set up of the rest to accommodate the first rifle, the M1A, took no more than a minute or so. The hardest part was getting the %&* set screw on the bench’s adjustable seat loosened so that the seat could be elevated a bit. Maybe CTK can make a better one of those too, LOL! Nonetheless, once the M1A was properly cradled in the rest’s forearm “U”, and the sloped portion of the buttstock’s underside was properly nestled in the rear rest assembly’s padded channel, final adjustment of both front and rear rest assemblies took only a couple of seconds each. In no time I had a perfectly solid 6 o’clock hold on a 100 yard target. Additionally the dimensions of the rest overall did not cause ergonomic challenges by way of “shouldering” the rifle once in the rest. The act of shooting in this position did not feel unnatural, or such that I felt I had to significantly modify my position or hold. After “snapping in” a few times (dry firing with a clean sight picture), the first string of three 168 grain BTHP Sierra’s were sent downrange. Subsequently one click down on elevation got me roughly centered on the bull, and from there the group was nicely clustered. While I don’t typically shoot from a rest of this type, I did appreciate the opportunity to remove the “hold” variables from the equation, thus allowing me to concentrate on front sight breathing and trigger press solely. After a couple of magazines, we switched to the M&P. My friend, being somewhat taller than I am, raised the front “U” rest up quite a bit to both accommodate his shooting position, and to adjust for the differences in the wood stocked M1A and the pistol-gripped Smith M&P 15. As with the M1A we found the rest to provide an extremely steady platform for firing the .223, allowing tight, consistent groups to be shot. No adjustment at 100 yards was needed on the Eotech and the testing with this rifle proceeded apace. I will have to admit, shooting an Eotech-scoped weapon of this type from a rest, while fun, is not as much fun as shooting it offhanded in the manner in which this type of sight was designed for. This is a move-n-shoot type set up! Nonetheless the rest would be an invaluable aid in properly zeroing the sight, or any telescopic sight, in an effective and efficient manner, had it not already been dialed in for that load and range combination. All in all, the afternoon of shooting with the rest was fun and informative. In terms of basic shooting it definitely provides a rock-solid rest that is quickly and easily adjustable. This would undoubtedly be conducive to improving longer range accuracy with scoped rifles. Now, let’s head back to the house and clean up the rifles. As can be seen in the accompanying photos, the rifle vise mechanism was affixed to the rifle rest frame so as to act as a both a rear rest and vise. After field stripping the M1A I placed the receiver end of the barreled receiver group into the vise in an inverted manner. This keeps solvents from leaking into the gas cylinder from the bore. Cleaning the bore, which on the M1A is from the muzzle end, was made much easier with the barreled assembly locked in the padded vise jaws. Similarly with the vise acting as a “third hand”, I was able to make minor adjustments to the rifle’s running gear and get it properly lubricated. Overall, I found CTK Precision’s P3 Ultimate Shooting Rest and P3 Ultimate Gun Vise both to be well thought out and well made pieces of equipment. In addition to not only being a solid and handy rifle rest with precise adjustment mechanisms, I particularly like the ability to easily attach a vise assembly with no other modification needed to the base rifle rest components. Lastly, the combined price point for both the P3 Ultimate Shooting Rest with the P3 Ultimate Gun Vise option is very attractive in relation to most of their lesser-featured competitors in this segment of shooting rest market. If you’re in the market for a feature-packed, solid, U.S.-made shooting rest and vise, give CTK Precision a look. They can be reached at www.ctkprecision.com, or at (715) 754-2891.